Few days back a factory’s roof collapsed and dozens got injured while many are still stuck beneath the scrap. An 18-year-old worker, identified as Shahid, was taken out alive after 50 hours and taken to Jinnah Hospital after being rescued on Friday evening. DCO Lahore mentioned that the teenager sustained injuries on his leg, adding that Shahid crawled out of the scrap on his own. 38 dead bodies of laborers have been recovered from under the rubble and hoped to retrieve remaining workers alive. Therefore scrap is cleared carefully. Earlier in the day, two more laborers were recovered from under the rubble as the death toll from the tragedy rose to at least 35, officials said. 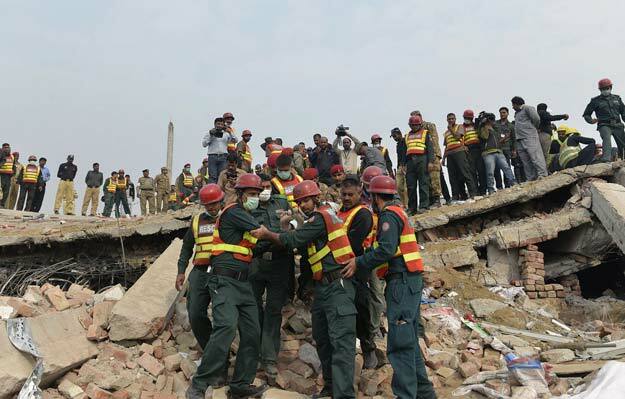 Rescue officials said over a hundred survivors had so far been pulled from the wreckage of the four-storied Rajput Polyester factory, which manufactured polyethene shopping bags about 45 km south of the Punjab capital, and collapsed on Wednesday night. 35 bodies have now been recovered by rescue crews using heavy construction machinery and other tools to dig through the debris, the rescue official said. Efforts were still underway on the third day of the search and rescue operation, to clear the debris and look for any survivors or bodies of the victims. After the roof collapse, no part of the building remained standing. It is also rumored that the owner of the factory has also expired. Whereas Lahore is hosting an international conference on business, we need to look into this matter carefully. Before starting any new venture, the old buildings who are in danger zones must be rebuilt first. What is the need of new business ventures when the laborers are not secure?